Last week was a week of two swarms, our second and third of the year. On Monday we were called after work to a very small swarm on the same tree in St Helens that most of our swarms land on. They had been there some time, but we got the call late and then couldn't get there until after work. They were still on the branch so we got out the equipment and set about collecting them as usual. 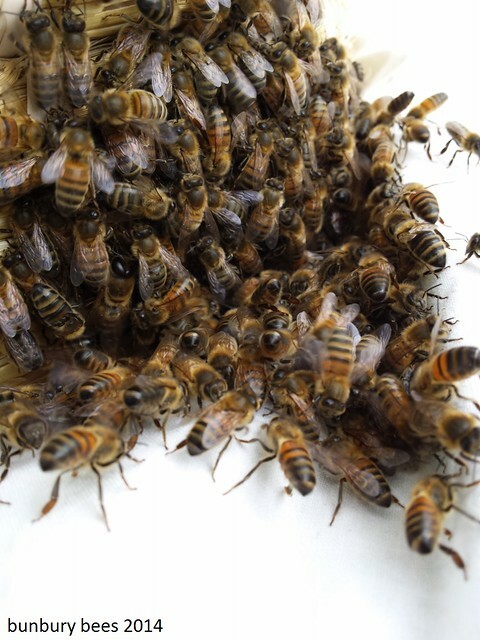 Being such a small swarm, we found the queen fairly easily and put her into the nuc. And then we found her again. And again. She really didn't want to stay! I had recently cleaned the nuc with soda crystals, so we wondered if there was a residual scent that was putting them off. The skep has never been cleaned and is full of a good bee-ish scent, so we tried that instead. We managed to get them in and from there moved them away and transferred them to the nuc. Hopefully the bees would accept it now as their new home. Friday afternoon, another after work call out to another swarm. This one was slightly bigger, and strangely enough it wasn't on the 'swarm tree'. Instead it was on a branch of another tree nearby. Again, we hadn't been able to get there straight away due to work, and by the time we arrived it was starting to get chilly. The bees were quite grumpy at being interfered with and both Chris and I got buzzed at angrily. Despite that, these bees were actually pretty well behaved, and did all the textbook things that I've been told about and never seen. 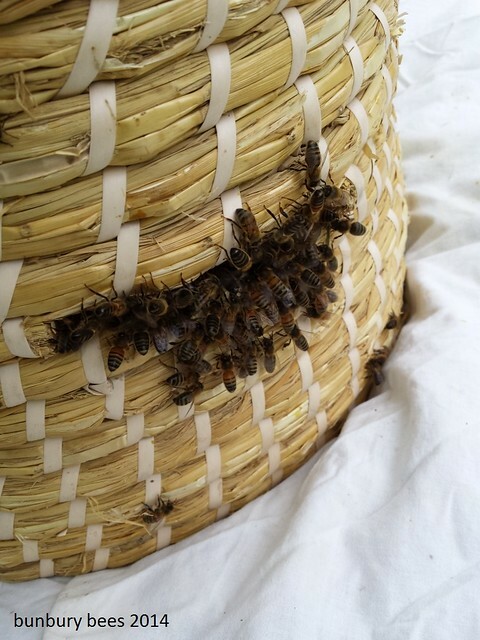 Chris got them in the skep first try, and immediately they flocked around the entrance and started fanning - a great sign that the queen is inside as they tell all the other bees that this is the place to be. The bees all gathered round and were trying to get underneath the skep as well as through the entrance, but almost immediately set up a little marching train going from the bottom to the entrance above. Perfect! 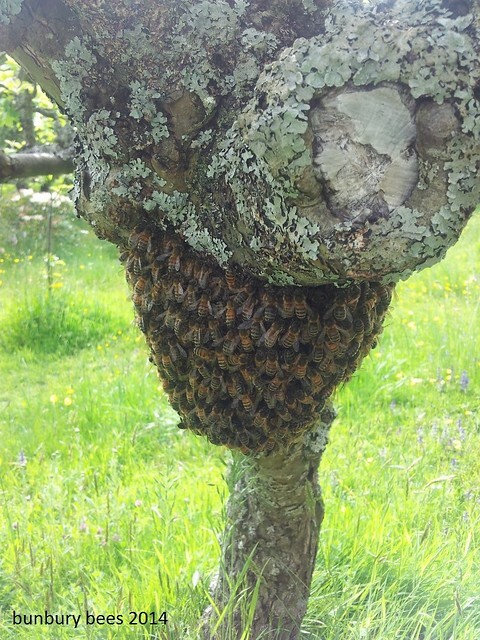 We waited a while and watched, and the small cluster of bees that had been left on the tree melted away before our eyes as the bees realised that the skep was their new home. After that, it was a simple manoeuvre to transfer them from the skep to a nuc and leave it in a safe place. Well done girls. As we were in St Helens, we decided to check the nuc that we'd put Monday's swarm in to. Empty. The bees had obviously decided they'd rather go somewhere else, and flown off. Not a bee to be seen. It's the first time this has happened to me and it is rather disappointing. I can't help feeling slightly responsible as I washed the nuc - but I'm not going to be too hard on myself about it, because they were also very reluctant to go into the skep. Maybe the fact that they had been there some time meant that they had already found a better place? I guess we'll never know.